This is a subject that repeatedly comes up in debates, we often have solar panels in parallel, and adding diodes into the chat seems to fuel the confusion as well. And aren’t blocking diodes built into all solar panels these days anyway? Or is it in the regulators? And is it better in series? Well the answer is yes, sort-of, no and maybe – but not necessarily in that order. Okay, let’s see if we can sort this out a bit. In the spirit of The 12Volt Blog we’ll call on some cool calm science, and untangle things a bit. We’ll start with the diodes – they’re a pretty simple device and we’ll also cover regulators, so that’ll get us going. Solar panels in parallel and series is a really important topic though, especially if they’re shaded, so we’ll leave the best till last. I think most of us know that Diodes allow current to flow in just one direction, and that can come in handy in 12Volt setups. Like most things in life it also comes at a price – and that price is a 0.6Volt drop, or a bit less if we choose a Schottky diode. So if we put diodes into a circuit, they need to be doing something useful for us. There are two functions a diode can perform in 12Volt solar systems – either as a blocking-diode or as a bypass-diode. When a solar panel is shaded, the output current reduces dramatically, and when it’s dark it actually absorbs current. This is a real problem at night, because we could lose all the power we gained during the day. This is where the blocking diode comes in, and its one-way properties means it will only allow current to flow out of the panel, but not back into it. Yes, we will lose 0.6V over the diode in the process, but that’s a heck-of-a-lot better than losing power all through the night. Well that’s how it was done in the early days of solar panels, nowadays this function is taken care of by the regulator. The regulator simply monitors the solar input, and when it dips below a certain threshold, it just disconnects the solar panel from the rest of the circuit. That way no power can leak back to the panel, so we’ve got the same function as the blocking diode but without the 0.6Volt drop – pretty neat, hey? 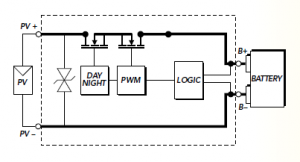 The diagram alongside shows how this is done inside a well-known brand of PWM regulator, using a day-night switch. So now we can comfortably say that the vast majority of modern regulators don’t need a blocking diode. And that holds true for panels in series or parallel as well. So now to that second function of a diode that could be useful to us. As we noted before, each panel is made up of a series connection of solar cells – for a 12Volt panel it’s typically got 36 cells – each cell is around 0.6Volts and that jives up with the open-circuit and maximum power voltages we mentioned before. Have a look at Solar Panels and Regulators if you need more on that. 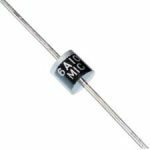 Now that 0.6Volts sounds suspiciously like the diode voltage we came across before – yep – in fact if you break open a large transistor, you’ll see a silicon wafer in there. What’s more, if you get some sunlight onto it, you’ll get about 0.6V output and some current too. So in its most basic form, each solar cell is similar to a diode – it’s just been tweaked a bit to maximise its output when exposed to the sun. So that gets us back to the solar panel, with its series string of these solar cells. What happens if one of those cells in the series string gets shaded? Well it’s a bit like the old-style Xmas lights – if one goes out, they all go out – because they are in a series string. Because the solar cells are in series, a drop in current in one or more cells will cause the current in the whole panel to drop. This is again where diodes can help us. If we now put a diode over each cell in the panel, then if one cell is shaded the total voltage will drop by 0.6V but the current from the other cells will still get through, because the diode allows the current to bypass the shaded cell. So to combat this shading problem for a typical 12Volt panel, this would mean 36 bypass diodes, one over each cell. As far as I’m aware, only one manufacturer ever made panels like that – UniSolar – and their panels were well known as the most shade-tolerant around. This however made them expensive, and in 2012 they unfortunately went out of business. These days most 12Volt panels are fitted with just 2 bypass diodes, with the panel effectively divided into 2 halves. So if just one half is shaded, then the output of that half drops, but the other half keeps going. In practical terms however this also means that the overall voltage is halved, so even for an open-circuit voltage of 22Volts, shading one half brings us down to 11Volts, which is not really that helpful in a 12Volt system. So the short answer is: shading very quickly drops the output of our solar panels, but the 2 bypass diodes do help a bit. So, what to do about this shading problem? Well having multiple panels could help – if I have two panels then it’s less likely both will be shaded at the same time, especially if I can mount them a distance apart. But what happens to the solar output? Do I actually get the combined output of the two panels, or does one pull the other down? And should they be in parallel or in series? As we promised at the beginning of the post – this is where it gets “interesting” – and we need to haul out some electrical theory to help us. Let’s see how some examples can help in practical terms. Actually, rather than bore everyone to tears with the theory and calculations, I’ve created a heading below For the Technically Minded – for those of us who are excited by such things. For the rest of us, who find their eyelids drooping at that sort of thing, we’ll keep this first bit for the results of those examples, and what the practical outcomes actually mean to the real-world camper. We’ll start off by setting the scene for the examples by using just two panels, and they are both 12Volt panels of the same wattage. One is shaded, and the other is in full sun. The shaded one is giving us a short-circuit current of 1 Amp, while the sunny one is delivering a nice 5Amps at short-circuit, which is typical of a panel around 80 Watts. If we now place the two panels in parallel, the short answer is that the currents add up, so we will have 6 Amps available at the input of our regulator. So what does that mean in practical terms? Well we have two panels, each one 80 Watts. Instead we could have opted for one big 160 Watt panel – same output, right? Well yes and no. If the 160W panel was in the sun, it would give us the same as 2 x 80W panels in the sun, namely 10 Amps at short-circuit. The difference comes when we have shade, like in this example. If the 160W panel is even partially shaded, its output will drop off quickly, to the same extent that the shaded 80W panel did, except twice the current because it’s twice as big, so it would give us a short-circuit current of 2 Amps. With the 2 x 80W panels, with one of them (half the total area) shaded we have our 6 Amps scenario above. So the short answer is that we’re getting 3 times the current from 2 half-size panels than we would from one full-size panel. So for shading, it’s always better to go for 2 smaller panels rather than one big one. With panels in parallel we can use either a PWM or MPPT regulator – there will be little difference – except in price. There’s more on this in Solar Panels & Regulators. Let’s now look at connecting the two 80W panels in series – one shaded, the other in the sun. As we show in detail below (For the Technically Minded) the open-circuit voltage stays pretty much the same when the panel is shaded, and we’ve used 22Volts in this example. So for a series connection the voltages add up, and a typical 12Volt panel’s open-circuit voltage would double to 44 Volts. So for a 12Volt system, our only option is an MPPT regulator for series panels. With this kind of voltage the first thing to look for is the maximum solar input voltage that the MPPT can handle. Many DC-DC chargers (with solar input) won’t be able to handle that sort of voltage, so check the specs carefully before connecting anything up. Now, what about the shading issue? Does series give us the same benefit? Well using our 2 x 80W panels, one shaded and one not, the detail workings below show a seriously reduced solar output. The series connection gives us just over half of the output that the parallel connection did. So, when we are looking at shading, parallel wins hands down. Of course there may be other factors that sway the decision towards series connection – for instance a fixed off-grid installation that has a long cable run from the panels to the regulator and batteries, and in that case the savings in cable size could make a lot of sense. Well unless you’re into the technical detail, that’s it! – Diodes, Regulators, Series and Parallel – and hopefully the facts we’ve gone through here helps to untangle the many confusions out there. In any case, we always welcome discussion, so please leave a comment if something doesn’t seem to make sense. So, one 80W panel in the sun giving us 5A and the shaded one giving us 1A – it seems logical that the 2 currents will simply be added – but is that right? What if the shaded panel drags the unshaded one down, so that we get less current than we thought? Just because it sounds logical to add them, doesn’t mean it’s right. So how can we be sure? Well in The 12Volt Blog we go to the science – and fortunately it has heaps to say about putting things in series and parallel. But before we put anything in series or parallel, we’ll need to look at the behaviour of solar panels when they’re shaded, and check that the currents we’ve chosen make sense, and also to see what happens to the open-circuit voltage when the panel’s shaded. The STC for panels is 1000W/m2 and in the IV-curve here that’s the dark blue line at the top – this represents full sunlight. As the solar intensity (W/m2) decreases it’s clear that the current reduces proportionally – on the 1000W/m2 curve it’s just above 5A, and on the 200W/m2 curve (20% of full sun, yellow) the current is about 1 Amp, so 20% of the current under full sun. This confirms that the currents we have chosen accurately represent full-sun and shaded conditions for our panels. For the open-circuit voltage, this is when the current is zero, and is therefore the point at which all the graphs converge on the x-axis. It is clear that even though the 5 coloured graphs represent a 5:1 range of solar intensities, the open-circuit voltage varies very little. For practical purposes there will be a negligible error if we assume the open-circuit voltage is constant for sunny and shaded conditions. Because we are using 12Volt panels in this example we will use an open-circuit voltage of 22Volts. Now comes the neat trick – it does get a bit mathsy, so hold on tight – I’ll even draw you some pictures. In electrical calculations there are two basic ways of representing a power-supply – either as a voltage-source, or a current-source. This allows us to calculate power-supplies in series and in parallel. The first diagram shows how the one format can be converted to the other using Ohm’s Law (see Electrical Basics for detail). They are exactly the same power-supply, just formatted differently. The Voltage Source makes it easy to combine power-supplies in series – they just add together. And the Current Source format makes it easy to combine power-supplies that are in parallel – we just add the currents together. And the short-form for parallel is //. In the second drawing we start putting our two panels in parallel. On the left is the one in full sun, on the right is the shaded one, both have the same open-circuit voltage (Voc) but the shaded one has less current, and a higher value for R.
When we put them in parallel, I’ve shifted the current-sources to the left and the resistors to the right – with a parallel circuit we can do that – they all still have the same connections to the positive and negative. So we can see in the next drawing that the two currents simply add up, while the resistors are in parallel. 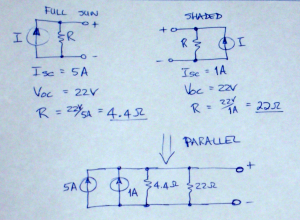 Two parallel resistors, like we have here, can be combined into a single resistor using a well-used formula (google it if you like) that multiplies the two resistors above the line, and adds them below. So we get (96.8/26.4) = 3.67Ω for the resistor and 6A for the current, as shown on the left. Now for the last conversion, moving from left to right in the drawing, we get it back to a voltage-source format so we can calculate the Watts of the two panels. 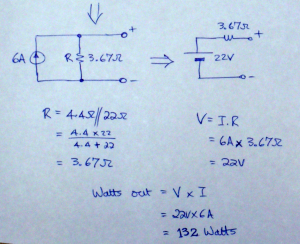 So with Watts = Volts x Amps, we get a total of 132 Watts for the case where we have our two panels in parallel. Now let’s see what sort of output we get when we put those two same panels in series. Like before we start off with both panels in the current-source format, but for a series connection we now convert them to voltage-sources, so we can just add the voltages and resistances. Unsurprisingly we get a voltage source of 22V which is the open-circuit voltage of the panels. To get a series configuration we connect the middle two terminals – a positive from the one below (shade) to the negative from the one above (sun) – that’s the little double-line making that series connection. 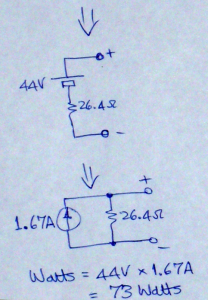 So the final bit is simply adding the two voltages and the two resistors, as shown in the final drawing. So for this series configuration we get a total of 44V which is also beyond the capability of many DC-DC converters, so a word of caution on that. Converting this to the current-source format again allows us to calculate the Watts we get from this series arrangement and it is immediately obvious who’s won this contest. Compared to the series configuration, the parallel connection gives us nearly double the output when we have one panel shaded – wow! That makes the decision really easy – to get maximum output in shaded conditions, it’s parallel all the way! And to those of you that are still reading all the way down here – congrats! That was a bit of a marathon wasn’t it?! Anyway, now we know we are not just basing our decisions on what we think, or hope, or assume – and if anyone disagrees with this stuff, then it’s not me they’ll be disagreeing with, but with the likes of Monsieur Ampere, Georg Ohm, Alessandro Volta, and even James Watt! Wow, this is a really interesting system – glad the 12Volt Blog has been useful so far! And I totally agree – theory can be useful, but only if we can plug it into real-world situations! So – the combination of series-parallel is good – usually done as a number of series strings, which are then each placed in parallel. And yes, the higher the voltage, the smaller the cable – and cheaper! – definitely on the right track there. BUT: most MPPTs can only handle a maximum input voltage from the panels of 150 Volts, even the good ones (take a look at Morningstar’s professional series). So each series-string has to have an open-circuit voltage less than that (plus 10% safety margin) so about 135V max. Now if you compare that to the AC voltage of 120V in Canada, then creating a midway powerhouse might not make so much sense. It might pay you to keep it DC all the way to the house, and then place the powerhouse where its easier to build. About shading – you’re doing the right thing by getting the panels up into the sun – and shading will largely be short-term, and the MPPT will compensate for it anyway. Not quite sure how much power you were looking at, but just a point on battery voltage. The higher you go, the more solar power you can handle. 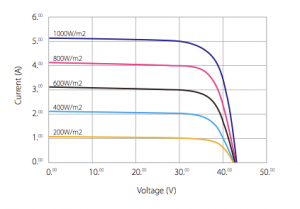 Again, have a look at the Morningstar datasheet for the 60Amp MPPT – going with a 24V battery will mean a maximum of 1600W of panels, whereas raising the battery voltage to 48V will mean the same 60A regulator can handle 3200W of panels. To elaborate on Volt-drop calcs you can use the calculator in the blogpost “how to avoid volt-drop”. For example if you have the maximum of 3200W panels, and if the open-circuit voltage is 135V, then the current will be (3200W/135V) = 24 Amps. Using your 100ft length (30m) means that even using just 6mm cable (AWG 10) will mean less than 6V drop, which is less than 5% – all good. This example can be reworked for your actual situation. Well, that’s quite a bit to digest – hope it makes sense – otherwise let’s chat some more! Thanks for the enlightening article. It really opened my eyes as I was not aware of this issue. What concerns me is real world scenario. Theory is great, but often enough, when paired with real world scenario, it may not be as black and white as it appears on paper. I know you touched on this issue before in other posts of yours, but I’d like to expand on that here. We live offgrid in the mountains of BC, Canada. We are stationary. We have bottom of the valley with parts of a hill above us. The hill is already sparsely treed due to deforestation decades ago. We are planning to put the panels there, as we will get far far more sun exposure than on the bottom of the valley. That being said, we will need to run about 100′ of DC cable from the solar panels to the power shack, where the batteries will reside. This is the closest we can build the powershack, since building it on the hill itself is problematic. In the powershack will be the batteries, solar charger (regulator), inverter, etc. From then on, an AC line will run down to the valley. You see, at 100′ voltage losses start to really really kick in. And cables are damn expensive too. So pairing up the solar panels in series, and then in parallel to achieve let’s say 150 or even 300V is something we will be desiring, because it will allow us to do a combination of thinner cable (less expensive) and/or less voltage drop. I understand you will likely concur with me that in these scenarios going combination of series/parallel makes sense. And that is often why panels are put in this combo in the first place. But here is the real world scenario: panels in full sun vs panels in shade. Given that nobody places panels across tens of feet between themselves to avoid potential shading of a whole bunch of panels, what is the LIKELYHOOD of a bank of several panels where some of them will be shaded while others will be in full sun? From my experience, either all will be shaded or none. Because the clouds in the sky are big enough and the footprint of the panels small enough that hardly will it happen for protracted period of time where some of the panels connected in series would be shaded while others would be in full sun. This is what I have observed. Given that we will be using a combination of series/parallel, that means further that only portion of our panels are in series. So to get to a point where only some of the panels connected in series would be shaded while others in the series are not – and for a duration of tens of minutes – I think that is very unlikely scenario.